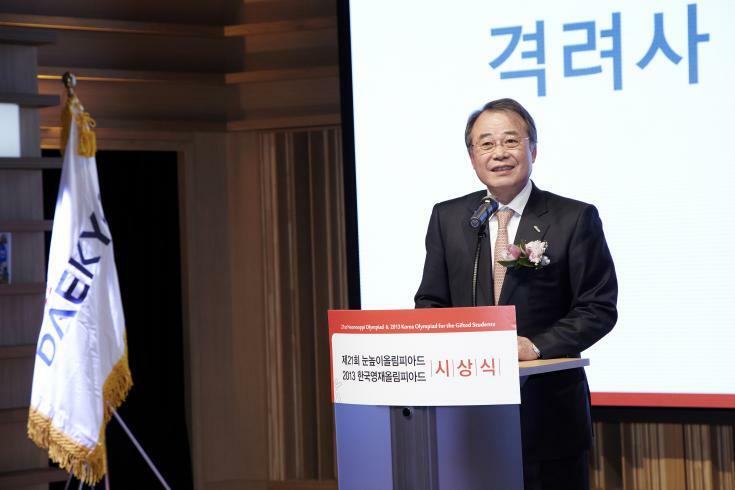 Chairman Dr. Kang, Young Joong attended ‘Korea Olympiad for gifted children 2013 award’ which was held at Eye Level Hall, Daekyo Tower on December 13. This Olympiad was created to discover those gifted children in mathematics and science in the nation. At this award ceremony, total 12 students awarded grand prize in mathematics and science. Certificate of award and the opportunity to attend training abroad will be provided to the best students in each subject. Also 24 students include the gold award winners received the certificate of award and the opportunity to attend training abroad as well. Meanwhile, the 21st Eye Level Olympiad award was also held at the same date. Total 97 students awarded (18 grand prize, 20 gold prize winners, 25 silver prize winners and 34 bronze prize winners) in Mathematics, Korean and English section. Grand prize winners had received certificate as well as the opportunity to attend training abroad and rest of winners received certificate and scholarship. Daekyo was inducted into the CSM Hall of Fame.